If you are a budding brewer or a beer enthusiast or simply someone who enjoys fine ales, a trip to Coopers Brewery is sure going to be a delightful experience. Here, at the brewery, you would get the chance to see each and every step of the process of beer and DIY beer production. As you enter, you would be taken to the Museum where you would get to know about the Coopers history. Next, you would be visiting the brewhouse and the onsite power station on your way. 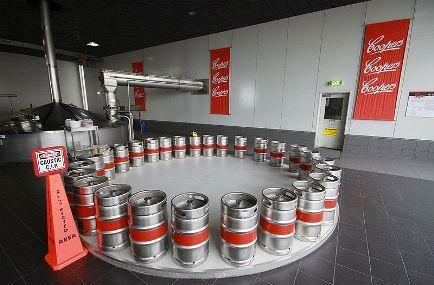 The bottling hall is also interesting and then would be taken back to the Museum for tasting the beer. The guided tour is very engaging and interesting and would sure be a memorable experience. Remember to wear closed toe shoes. Visitors have to be 18 years or over. Tour Timings- Tuesday to Friday at 1.00 pm. How popular is Coopers Brewery? People normally club together Adelaide Gaol and Botanic Garden Restaurant while planning their visit to Coopers Brewery. Great tour, money well spent. Very informative and engaging guide, there's no lack of interesting bits and pieces to see. The process is explained well with some particularly intriguing engineering that I won't spoil. Majority of the money collected from running the tours is donated to charity, so even if you've been before it's worth going back again. The guide for the brewery tour was very well-versed in his beer knowledge. Beautiful brewery! Because the Cooper family shouldn't force the concept of a plebiscite on the Australian population, and the fact that the Sparkling Ale has a horrible chemical aftertaste that it never used to have, probably from mass producing the stuff in the industrial suburb of Regency Park, as opposed to the more 'hands on' approach to brewing that they used to have in the upmarket eastern suburbs. I have to wonder how their LGBTI employees must feel about all this? Attacked? With such a large workforce, they'd be bound to have discriminated against some by initially stating there was a need for "light conversation", while bringing in some right-wing pollies and the Bible Society to promote their desire for a national plebiscite. After all, that's what that was... a mini plebiscite, and according to the first press release, it was a plebiscite (conversation) we need to have. Coopers Ale... who knew? I am very disappointed with Coopers Brewery. Why have you reduced the volume of your Coopers Light by 20 ml - this smacks of corporate greed. I would expect this type of manoeuvre from the likes of large canned food suppliers or confectionary makers but not the highly respected Coopers Limited. Shame! I have also noticed the volume indicator is obscured on the side of the can. As a loyal customer of more than 40 years I can only say this has left an unpleasant taste in my mouth.